Rakk are flying creatures native to Pandora. They do not have beaks. Instead, they have a flat, fleshy head ending with a pointed snout, with a brightly colored, bony plate on the top, and hooked, rasping barbs lining a soft, slit-like mouth on the bottom. Rakk do not have grasping claws or lower limbs, and instead have a set of curved, razor-sharp talons upon a flexible tail that they use to adhere to rocky surfaces. Rakk appear to be highly social creatures with a task-based hierarchy that includes scouts, hive defenders, food processing, and perhaps even long-term food storage not unlike honeypot ants on Earth. They are known to be vocal, howling or screeching to rally a flock when a target presents itself or proves itself to be a threat. They also emit a screech at the moment of their slashing attack. Effect: The rakk flies up to its speed and uses tail slash once during that movement. It does not provoke opportunity attacks when moving away from the target of the attack. 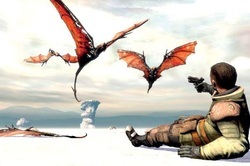 The common rakk is dark brown with bright orange markings on its head, tail, and wings. Rakk can normally be seen circling in the sky waiting for something to blunder into the territory of its flock. Sometimes they can also be seen hanging upside down, preening itself with its rasp-covered mouth. Carnivorous and known to kill living prey, rakk can swoop down and use their tail to lacerate their targets without losing speed, letting them quickly gain altitude and set up another attack run. They are extremely fragile and almost any weapon can be used to dispatch individual rakk fairly quickly.